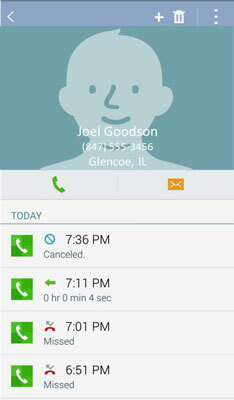 One of the nice features of cellular phones, like the Samsung Galaxy S 5, is that the phone keeps a record of the calls that you’ve made and received. Sure, you might have caller ID on your landline at home or work, but most landline phones don’t keep track of who you called. Cellphones, on the other hand, keep track of all the numbers you called. This information can be very convenient, like when you want to return a call, and you don’t have that number handy. In addition, you can easily add a number to the contact list on your phone. Outgoing call you made: An orange arrow points to the number. Incoming call you received: A green arrow points away from the number. Incoming call you missed: A red phone silhouette appears with a broken arrow. Incoming call you ignored: A blue slash sign is next to the phone icon. See the date and time the call was logged and all previous calls to and from this number. Call the number by tapping the green call button. Send a text to that number by tapping the number and then tapping Send Message on the pop-up screen that appears. Mark that number as a favorite by tapping the star icon. Your favorites appears on the Keypad screen, which saves you from having to dial the number. Tapping on any of the numbers in the call log takes you to a detail page for that phone number. 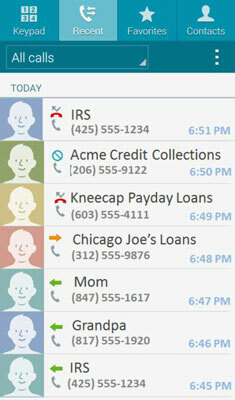 From there, you can call or text the number, view all calls to and from the number, and add or edit the contact. But you don’t have to go to that screen to make a call or text the person. If you touch the contact and swipe it to the right, the phone dials the contact. If you swipe it to the left, the phone brings up the messaging app so you can text the number.